My Fellow Citizens: – On yesterday evening, upon the occasion of the reception given to Senator Douglas, I was furnished with a seat very convenient for hearing him, and was otherwise very courteously treated by him and his friends, and for which I thank him and them. During the course of his remarks my name was mentioned in such a way, as I suppose renders it at least no improper that I should make some sort of reply to him. I shall not attempt to follow him in the precise order in which he addressed the assembled multitude upon that occasion, though I shall perhaps do so in the main. A QUESTION OF VERACITY – THE ALLIANCE. I have made up my mind to appeal to the people against the combination that has been made against me! – the Republican leaders have formed an alliance, an unholy and unnatural alliance, with a portion of unscrupulous federal office-holders. I intend to fight that allied army wherever I meet them. I know they deny the alliance, but yet these men who are trying to divide the Democratic party for the purpose of electing a Republican Senator in my place, are just as much the agents and tools of the supporters of Mr. Lincoln. Hence I shall deal with this allied army just as the Russians dealt with the allies at Sebastopol – that is, the Russians did not stop to inquire, when they fired a broadside, whether it hit an Englishman, a Frenchman, or a Turk. Nor will I stop to inquire, not shall I hesitate, whether my blows shall hit these Republican leaders or their allies who are holding the federal offices and yet acting in concert with them. Mr. Lincoln – No, sir, I never heard of even John Calhoun saying such a thing. He insisted on the same principle as Judge Douglas; but his mode of applying it in fact, was wrong. It is enough for my purpose to ask this crowd, when ever a Republican said anything against it? They never said anything against it, but they have constantly spoken for it; and whosoever will undertake to examine the platform, and the speeches of responsible men of the party, and of irresponsible men, too, if you please, will be unable to find one word from anybody in the Republican ranks, opposed to that Popular Sovereignty which Judge Douglas thinks that he has invented. [Applause.] I suppose that Judge Douglas will claim in a little while, that he is the inventor of the idea that the people should govern themselves. [cheers and laughter]; that nobody ever thought of such a thing until he brought it forward. We do remember, that in the old Declaration of Independence, it is said that ‘We hold these truths to be self-evident that all men are created equal; that they are endowed by their Creator with certain inalienable rights; that among these are life, liberty, and the pursuit of happiness; that to secure these rights, governments are instituted among men, deriving their just powers from the consent of the governed.’ There is the origin of Popular Sovereignty. [Loud applause]. A voice – Judge Douglas. Mr. Lincoln – Why, yes, Douglas did it! To be sure he did. A voice – Who killed the bill? Mr. Lincoln – Ground was taken against it by the Republicans before Douglas did it. The proportion of opposition to that measure is about five to one. I am not, in the first place, unaware that this Government endured eighty-two years, half slave and half free. I know that. I am tolerably well acquainted with the history of the country, and I know that it has endured eighty-two years, half slave and half free. I believe – and that is what I meant to allude to there – I believe it has endorsed because, during all that time, until the introduction of the Nebraska Bill, the public mind did rest, all the time, in the belief that slavery was in course of ultimate extinction. [‘Good!’ ‘Good!’ and applause.] That was what gave us the rest that we had through that period of eighty-two years; at least, so I believe. I have always hated slavery, I think as much as much as any Abolitionist. [Applause.] I have been an Old Line Whig. I have always hated it, but I have always been quiet about it until this new era of the introduction of the Nebraska Bill began. I always believed that everybody was against it, and that it was in the course of ultimate extinction. (Pointing to Mr. [Orville H.] Browning, who stood near by.) Browning thought so; the great mass of the nation have rested in the belief that slavery was in course of ultimate extinction. They had reason so to believe. The adoption of the Constitution and its attendant history led the people to believe so; and that such was the belief of the framers of the Constitution itself. Why did those men, about the time of adoption of the Constitution, decree that Slavery should not go into the new Territory, where it had not already gone? Why declare that within twenty years the African Slave Trade, by which slaves are supplied, might be cut off by Congress? Why were all these acts? I might enumerate more of these acts – but enough. What were they but a clear indication that the framers of the Constitution intended and expected the ultimate extinction of that institution. [Cheers.] And now, when I say, as I said in my speech that Judge Douglas has quoted from, when I say that I think the opponents of slavery will resist the farther spread of it, and place it where the public mind shall rest with the belief that it is in course of ultimate extinction, I only mean to say, that they will place it where the founders of this Government originally placed it. I have said a hundred times, and I have now no inclination to take it back, that I believe there is no right, and ought to be no inclination in the people of the free States to enter into the slave States, and interfere with the question of slavery at all. I have said that always. Judge Douglas has heard me say it – if not quite a hundred times, at least as good as a hundred times; and when it is said that I am in favor of interfering with slavery where it exists, I know it is unwarranted by anything I have ever intended, and, as I believe, by anything I have ever said. If, by any means, I have ever used language which could fairly be so construed, (as, however, I believe I never have,) I now correct it. Now, in relation to his inference that I am in favor of a general consolidation of all the local institutions of the various States. I will attend to that for a little while, and try to inquire, if I can, how on earth it could be that any man could draw such an inference from anything I said. I have said, very many times, in Judge Douglas’ hearing, that no man believed more than I in the principle of self-government; that it lies at the bottom of all my ideas of just government; that it lies at the bottom of all my ideas of just government, from beginning to end. I have denied that his use of that term applies properly. But for the thing itself, I deny that any man has ever gone ahead of me in his devotion to the principle, whatever he may have done in efficiency in advocating it. 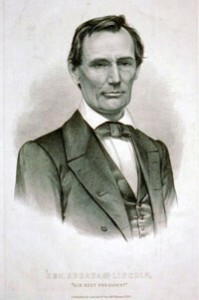 I think that I have said in your hearing – that I believe each individual is naturally entitled to do as he pleases with himself and the fruit of his labor, so far as it in no wise interferes with any other man’s rights – [applause] – that each community, as a State, has a right to do exactly as it pleases with all the concerns within that State that interfere with the rights of no other State, and that the general government, upon principle, has no right to interfere with anything other than that general class of things that does concern the whole. I have said that at all times. I have said, as illustrations, that I do not believe in the right of Illinois to interfere with the cranberry laws of Indiana, the oyster laws of Virginia, or the Liquor Laws of Maine. I have said these things over and over again, and I repeat them here as my sentiments. So much then as to my disposition – my wish – to have all the State legislatures blotted out, and to have one general consolidated government, and a uniformity of domestic regulations in all the States, by which I suppose it is meant if we raise corn here, we must make sugar cane grow here too, and we must make those which grow North, grow in the South. All this I suppose he understands I am in favor of doing. Now, so much for all this nonsense – for I must call it so. The Judge can have no issue with me on a question of establishing uniformity in the domestic regulations of the States. A little now on the other point – the Dred Scott Decision. Another one of the issues he says that is to be made with me, is upon his devotion to the Dred Scott Decision, and my opposition to it. Mr. Lincoln – That is what I would do. [‘You will have a chance soon.’] Judge Douglas said last night, that before the decision he might advance his opinion, and it might be contrary to the decision when it was made; but after it was made he would abide by it until it was reversed. Just so! We let this property abide by the decision, but we will try to reverse that decision. [Loud applause – cried of ‘good.’] We will try to put it where Judge Douglas would not object, for he says he will obey it until it is reversed. Somebody has to reverse that decision, since it is made, and we mean to reverse it, and we mean to do it peaceably. What are the uses of decisions of courts? They have two uses. As rules of property they have two uses. First – they decide upon the question before the court. They decide in this case that Dred Scott is a slave. Nobody resists that. Not only that, but they say to everybody else, that persons standing just as Dred Scott stands is [sic] as he is. That is, they say that when a question comes up upon another person it will be so decided again, unless the court decides in another way, [cheers – cries of ‘good,’] unless the court overrules its decision. [Renewed applause]. Well, we mean to do what we can to have the court decide the other way. That is one thing we mean to try to do. Mr. Lincoln – I should say at least that that is a self evident truth. My friend has said to me that I am a poor hand to quote Scripture. I will try it again, however. It is said in one of the admonitions of the Lord, ‘As your Father in Heaven is perfect, be ye also perfect.’ The savior, I suppose, did not expect that any human creature could be perfect as the Father in Heaven is perfect, be ye also perfect.’ He set that up as a standard, and he who did most towards reaching that standard, attained the highest degree of moral perfection. So I say in relation to the principle that all men are created equal, let it be as nearly reached as we can. If we cannot give freedom to every creature let us do nothing that will impose slavery upon any other creature. [Applause.] Let us then turn this government back into the channel in which the framers of the Constitution originally placed it. Let us stand firmly by each other. If we do not do so we are turning in the contrary direction, that our friend Judge Douglas proposes – not intentionally – as working in the traces tend to make this one universal slave nation. [A voice – ‘that is so.’] He is one that runs in that direction, and as such I resist him . My friends, I have detained you about as long as I desired to do, and I have only to say, let us discard all this quibbling about this man and the other man – this race and that race and the other race being inferior, and therefore they must be placed in an inferior position – discarding our standard that we have left us. Let us discard all these things, and united as one people throughout this land, until we shall once more stand up declaring that all men are created equal. Roy P. Basler, editor, The Collected Works of Abraham Lincoln, Volume II, p. 484-502 (Speech at Chicago, Illinois, July 10, 1858, primarily as recorded by the Chicago Daily Democrat).